Enclosed Race Bypass Valve with Aluminum Flange and Mounting Hardware. This Race Valve comes with an aluminum flange that needs to be welded into the aluminum intercooler tubing. Applications utilizing intercooling and those operating at boost levels in excess of 8 psi will benefit from the use of a bypass valve (commonly referred to as a “surge” valve). In high RPM, low load conditions, the supercharger is still operating at full speed and attempting to deliver full flow. With the throttle blade(s) at or near the fully closed position, the engine is unable to accept the airflow from the supercharger. In this event the pressure builds until the flow attempts to reverse direction and exit through the compressor, resulting in a harmful condition known as compressor surge. 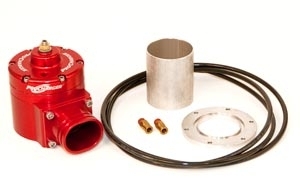 Installing a bypass valve between the supercharger discharge and the carburetor/throttle body prevents damaging compressor surges by diverting the undemanded charge air to the atmosphere during manifold vacuum conditions. 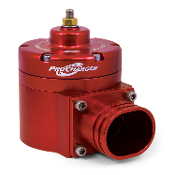 ATI’s butterfly-type Pro-Flo is well suited for applications making 750 hp or less. Applications at higher power levels are best suited for use with our poppet-style race valve.